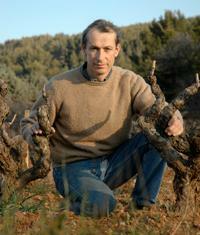 Before acquiring vineyards, Georges Delille trained as a sommelier in Paris. In 1963, he bought what would become Domaine de Terrebrune, a property in Ollioules, just east of Bandol, framed by the Mediterranean and the mountain called Gros-Cerveau (Big Brain), dotted with olive groves and scenic views--an idyllic spot. During the years following the declaration of A.O.C. Bandol (1941), mass overhauling and reconstruction of vineyards were commonplace, and vignerons were eager to revive the noble Mourvèdre grape. Georges spent ten years just renovating the property; he terraced hillsides, refashioned the masonry, replanted vineyards following the advice of Lucien Peyraud, designated soils to lie dormant and regenerate, and built a new cellar. In 1980, his son Reynald joined him after finishing winemaking school, and together they launched their first bottled vintage of Domaine de Terrebrune, which Reynald named in honor of the rich, brown soils they farm. Reynald's Bandols are different. There is a more ethereal quality to them, a real freshness--and with Mourvèdre accounting for 85% of the final assemblage, this is praise indeed. Soil, climate, and winemaking all play a role. Limestone dominates the subsoil of Bandol, with tremendous variation between vineyards. Throughout Terrebrune's thirty hectares, beneath the layers of clay and earth, the blue, fissured, Trias limestone is silently at work. This bedrock lends a more noticeable minerality to the wine than others. The soil here is healthy and full of nutrients, because he adheres to organic farming practices; to achieve the balance in the vineyards, he plows regularly. Gentle maritime breezes funnel air into the vineyards directly from the Mediterranean, cooling the grapes from the bright sun--another factor in safeguarding the freshness. This, in turn translates to wines for great long-term cellaring, including the rosé and dry white. Reynald's credo of "Philosophy, Rigor, and Respect" is not a catch-phrase. He believes that the hard work and extra attention to the vines is worth it, and, as they say, the proof's in the pudding--a glass of Terrebrune!